Non-unionized employees are typically “at-will employees”. As “at-will employees” – either they or their employer may end the employment relationship with no notice or reason. 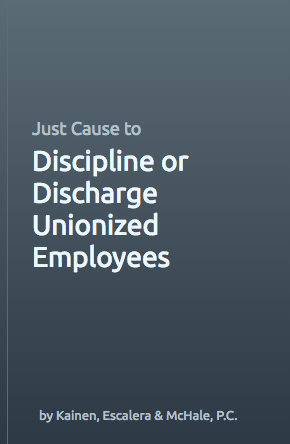 Employers with unionized workforces have collective bargaining agreements that usually proscribe that discharge or discipline of employees can only occur if the employer establishes “just cause” for doing so. If a union files a grievance over the termination of a union member, the employer typically has the burden to show “just cause” existed for the termination during a labor arbitration hearing. How does one establish “just cause”? That was a difficult question until 1966. That year, Carroll R. Daugherty, an arbitrator in a grievance case involving Enterprise Wire Co. and Enterprise Independent Union, established a list of questions to determine whether a given case met the threshold – and it became known as the Seven Tests of Just Cause. In that case, an employee had been terminated for unsatisfactory work and refusal to work as directed. The contract in force in that instance stated that management had the right to discipline or discharge employees for “cause” and employees should not be discharged or disciplined except for “proper cause.” Arbitrator Carroll R. Daugherty realized there was no definition for these terms and decided to create his own just cause definitions to guide his decision in the case. To this day, these seven questions are widely cited as the appropriate “formula” for determining whether an employee’s actions have met a contractual (or policy) just cause standard. If you need help understanding the rules surrounding “just cause” terminations from an employer’s vantage point, call a well trained Connecticut labor law attorney. Each of the attorneys at Kainen, Escalera & McHale have over twenty years of experience with these matters. And we are Connecticut’s leading employer defense law firm. Contact us if we can help you.